DSA Portland shared some footage of a recent interaction with Senator Ron Wyden at one of his town halls in Oregon. 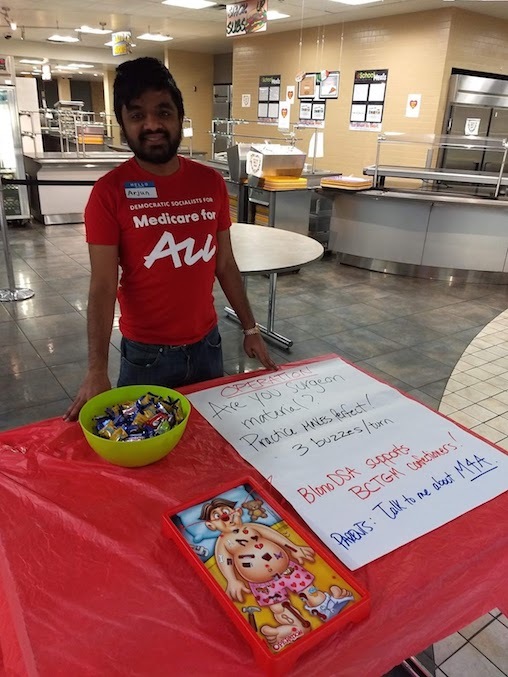 One of our comrades, Adam, had an opportunity to share why Medicare for All would be a benefit to him and his family - take a look. Sen. Wyden has yet to co-sponsor the Medicare for All bill in the senate, S.B.1804. His Democratic counterpart Senator Jeff Merkley has—thanks, Senator! 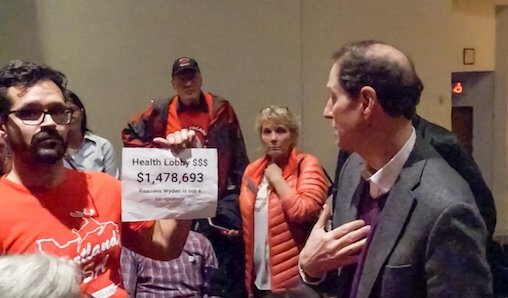 Incidentally, Sen. Wyden has received over $1.4 million from big pharma and the healthcare lobby since 2015 alone. During the town hall, the Senator asked to speak with the campaign afterward. Sen. Wyden gave some lip service on incrementalism and how he's fighting prescription drug costs and gave other reasons why he isn’t going to support Medicare for All. Sen. Wyden asked us to look at his record and point to a single piece of legislation that he has not supported because of the money he receives, and we did; the answer is simple. The Medicare for All bill is legislation that Wyden does not currently support because of the money he has received. Medicare for All would give millions of Americans the care that they so desperately need. 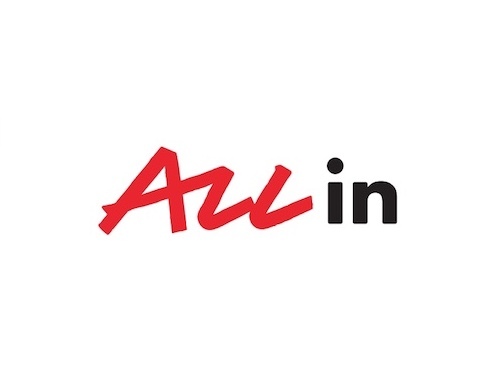 Hello and welcome to the first issue of All In of 2019! We’re glad you’re joining us in the new year to continue fighting for Medicare for All. We even have a late gift: The most comprehensive study on Medicare for All to date. The 200-page analysis of Bernie Sanders’ Senate bill comes from the University of Massachusetts-Amherst’s Political Economy Research Institute (PERI), and finds that Medicare for All will save the US $5.1 trillion over 10 years while drastically cutting ordinary Americans’ healthcare expenses. And many health policy experts believe that's a conservative estimate! At long last, Medicare for All advocates have credible economic research to supplement our most important arguments: that single-payer healthcare will save lives, end healthcare insecurity, and help us build a more just society anchored by solidarity. The average individually-insured family would save nearly $8,400 per year under Medicare for All. The average employer-insured family would save $1,570. 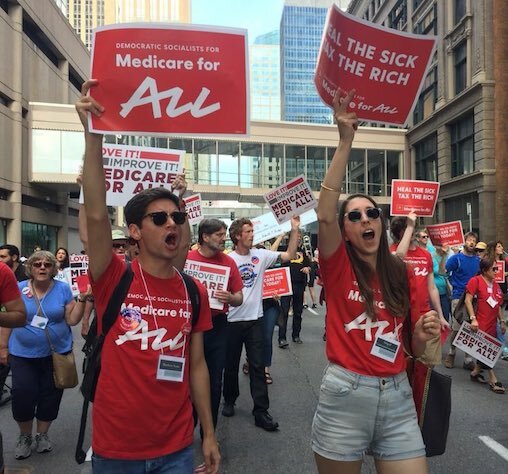 The morning after key elements of the Affordable Care Act were struck down in a Federal Court in Texas, the Bloomington-Normal Democratic Socialists of America doubled-down on the chapter’s Medicare for All organizing efforts. While tabling, our members had more than 20 unique conversations leading to support for M4A throughout the day, and despite some setbacks from traditional detractors in our community, our M4A working group and DSA member-organizers pulled out all the stops to bring the message of healthcare being a human right to the working class of McLean County, IL. Leading up to that morning, the Bloomington-Normal DSA had been granted permission to participate (host an Operation tournament) in the annual Trades and Labor Christmas Party for the Un(der)employed Families of McLean County, hosted by McLean County Chamber of Commerce and the Bloomington and Normal Trades and Labor Assembly. However, When our six member-organizers arrived at the local high school to set up our table, the local Chamber of Commerce director - let’s call him “Mr. 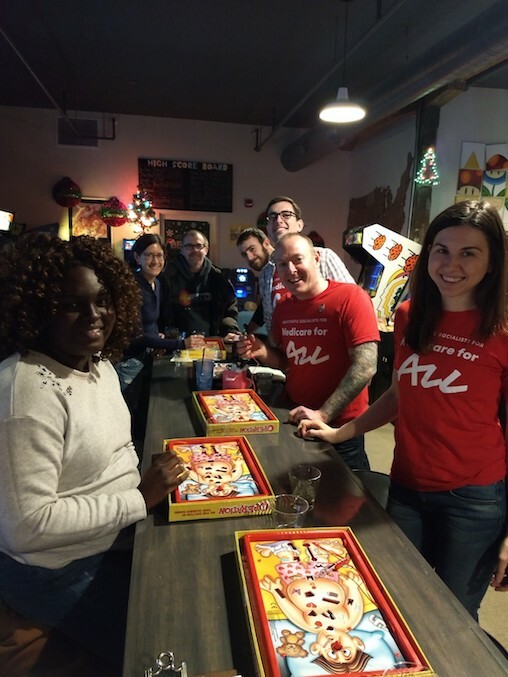 Commerce” - instructed the event’s lead labor organizer of the event to tell us to leave, citing the DSA’s presence was “inappropriate” for a children's' charity event. Originally appeared in the Winter 2018 issue of Democratic Left. Women who work outside the home are facing a generational crisis as they find themselves searching for home care for elderly relatives. The U.S. elderly population, defined as those age 65 or older, accounted for 13% of the population in 2010, a figure expected to grow to 20% by 2030. 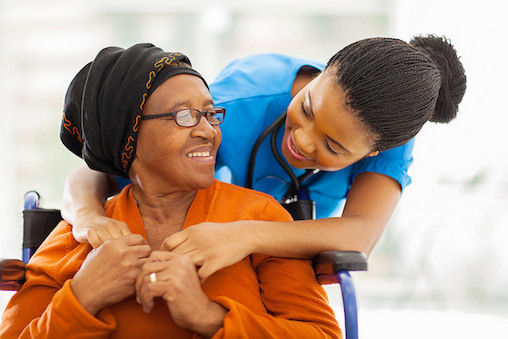 The elderly population has greater need for in-home care and few means to attain it. For this reason, caregiving often falls to the family—particularly wives, daughters, and daughters-in-law. Daughters are 28% more likely to care for an elderly parent than are sons, and women provide almost two-thirds of unpaid elder care overall. Time magazine highlighted the case of Ruby Lawrence, who had to shoulder the burden of caring for her elderly mother with dementia because her family could not pay for extended long-term care but was not poor enough to qualify for Medicaid. Caregivers like Lawrence may also experience negative psychological consequences, such as anxiety, depression, and stress, as a result of providing care. Originally appeared at Jacobin on November 16, 2018. With the Democrats’ retaking of the House, Republicans will no longer have the votes to try, once again, to “repeal and replace” Obamacare with their latest ghoulish plan to block millions from the healthcare system. In an era where voters consistently rank health care as their number one issue, the election results were widely seen as a repudiation of right-wing ideology on health care. 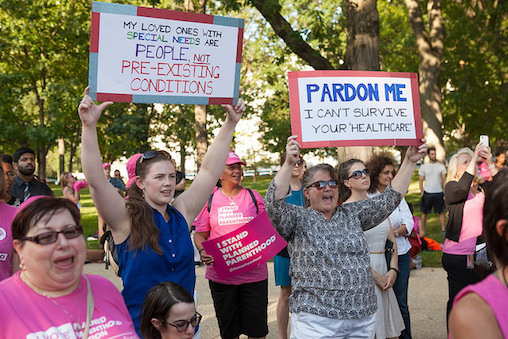 Like practically every partisan fight over the future of Obamacare, the midterm battles foregrounded the law’s most popular plank: protection for people with preexisting conditions. So supportive are voters of that policy (recent polls register approval at over 80 percent) that Republicans publicly pledged their commitment to the cause: “All Republicans support people with pre-existing conditions,” Donald Trump tweeted in October. “And if they don’t, they will after I speak to them.” Midterm voters, it seems, were justifiably skeptical of this promise, which contradicted both the party’s legislative record and the logical underpinnings of right-wing economic policy. Published by Democratic Socialists for Medicare for All with permission from The Intercept in partnership with Documented. Welcome to the second issue of All In, the Democratic Socialists for Medicare for All newsletter! First, we have some celebrating to do: Democratic Socialists all over the country ran and won elections in the midterms, and many centered M4A as a key component of their campaign. Alexandria Ocasio-Cortez (D-N.Y.) and Rashida Tlaib (D-MI) were elected to Congress, while the number of Democratic Socialists elected to state legislatures jumped from just four to 11. While the blue “wave” turned out to be more of a trickle, these small gains made by socialists all over the country show our movement is growing and that people are “ready to rally around a politics that foregrounds classwide demands.” Let’s keep the momentum up! Bernie Sanders sealed Medicare for All’s place in the popular imagination with his 2016 presidential run. Originally appeared at Jacobin on October 22, 2018. Kristin Seale is a democratic socialist candidate for the Pennsylvania House of Representatives. 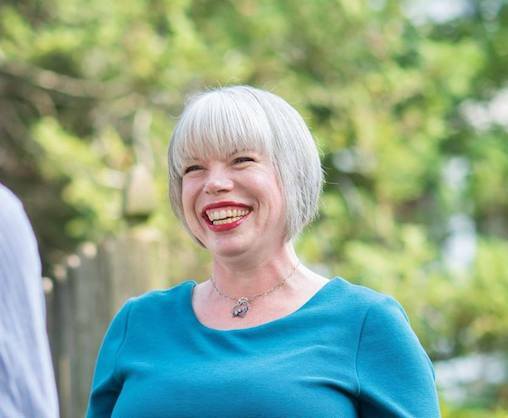 She’s running to represent the 168th district in Delaware County, which encompasses the southern suburbs of Philadelphia. Seale’s campaign is endorsed by the Democratic Socialists of America, and she’s a member of Philadelphia DSA. Seale is a full-time worker whose family depends on her income, which means she’s been campaigning in her off-hours. She was a labor delegate for Bernie Sanders at the Democratic National Convention in 2016, and her platform sounds a lot like those of Sanders and the candidates he’s inspired since his presidential run: Medicare for All, a $15 minimum wage, tuition-free college and student debt relief, and strong action against corporations on behalf of the environment. Jacobin’s Meagan Day talked with Seale about the public versus the private provision of goods and services, and the rise of working-class politics in the United States. Let’s start with healthcare, which is the first issue on your platform. How is the private health insurance system failing ordinary people? Originally appeared at Jacobin, December 8, 2017. 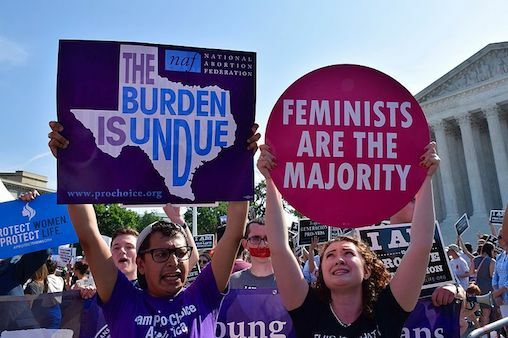 Demonstration before the Supreme Court of the United States, June 2016. Jordan Uhl/Flickr.